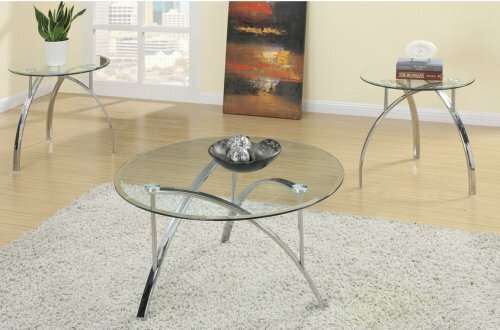 At first sight, this coffee table set looks simple to the eye, but look closely and you will see round clear tabletops with shiny silver arched legs crisscrossing to form a waterfall design making it an exciting piece of home furnishing. Dimensions:COFFEE: 30" DIA. X 19"HEND: 24" DIA x 23"H Some assembly may be required. Please see product details. 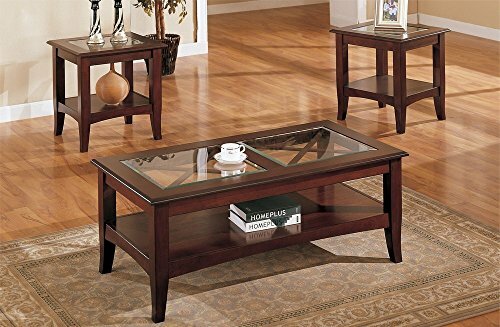 An opulent design of texture and shape, this coffee table set features smooth tempered glass tabletops supported by wide tree-like frame and solid rounded lower shelf. 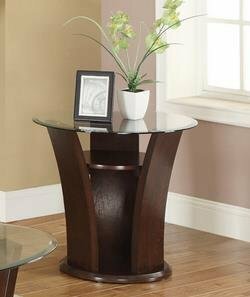 Each piece in this collection of accent tables is uniquely design to serve a purpose in your home living room. Dimensions:26"DIA x 24"H Some assembly may be required. Please see product details. 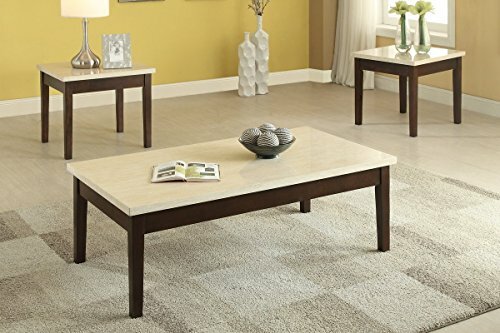 Top off your living space décor with this 3-piece coffee table set that features a coffee table and two end tables with marble finished countertops and black leg supports. 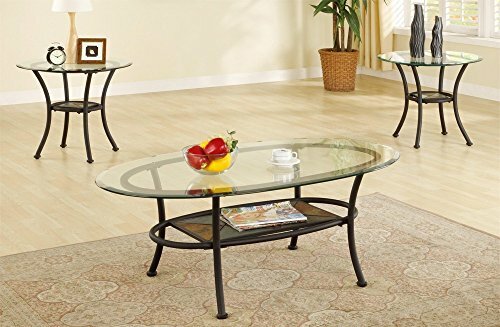 This collection is a simple and modern coffee table set accented with oval tables supported by colorful mosaic black framed legs. Please be aware that actual slates color and cut may vary due to the natural stone. Other accessories sold separately. Dimensions:Coffee: 48" x 28" x 18"HEnd: 26" Dia. x 21"H Some assembly may be required. Please see product details. 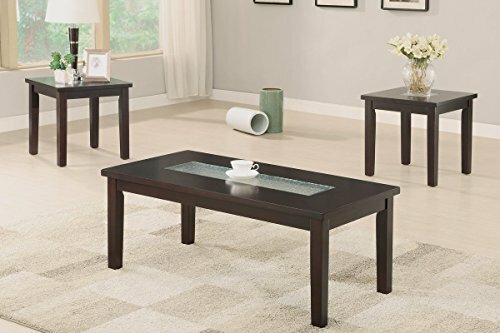 Top off your living space décor with this 3-piece coffee table set that features a coffee table and two end tables with marble finished countertops and dark espresso leg supports. 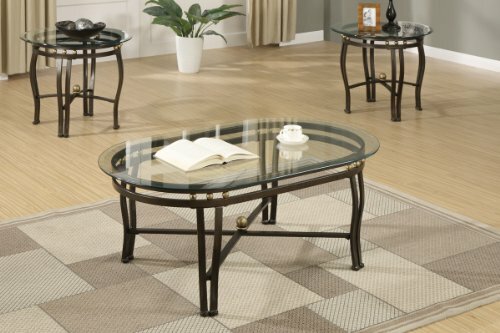 A timeless piece of living room furniture, this 3-piece coffee table set features clear glass beveled oval shaped tape tops with dark bronze finished metal base and legs accented with gold spheres. Dimensions:Coffee: 48" x 28" x 18"HEnd: 26" Dia. x 22 Some assembly may be required. Please see product details. 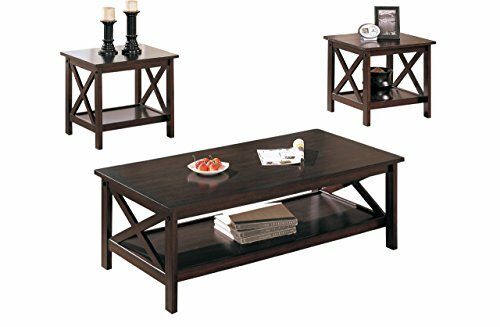 Blending luminous light with deep bold colors is provided by this 3-piece coffee table set that features an asymmetrical center cut-out framed in a rich dark brown. Dimensions:- Coffee: 48" x 24" x 19"h- end: 22" x 22" x 22"h - some assembly may be required. Please see product details. 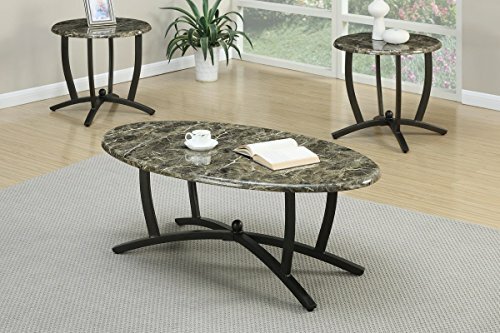 Copyright © Wholesalion.com 2019 - The Best Prices On Poundex Set Coffee Table Online.